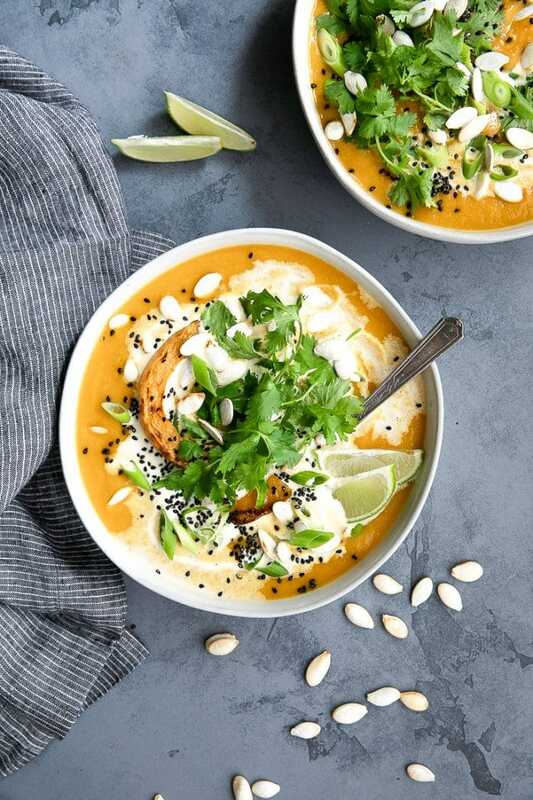 This Miso Coconut Butternut Squash Soup combines rich and complex flavors from roasted and caramelized butternut squash, creamy coconut milk, and salty miso to create a smooth, creamy, and gluten-free vegetable-filled soup loved by the whole family. Rain or shine, soup is always a welcome sight on my dinner table. For me, though, soup is more than just a meal to feed my body. Yes, that is a part of it. After all, make a good soup and eating may even be the best part. But soup making is a process. Sometimes fast, often slow, but either way, a process that takes love and care. Don’t worry, this squash soup recipe is not hard to make. It’s actually super easy. However, this is more than just a squash soup. 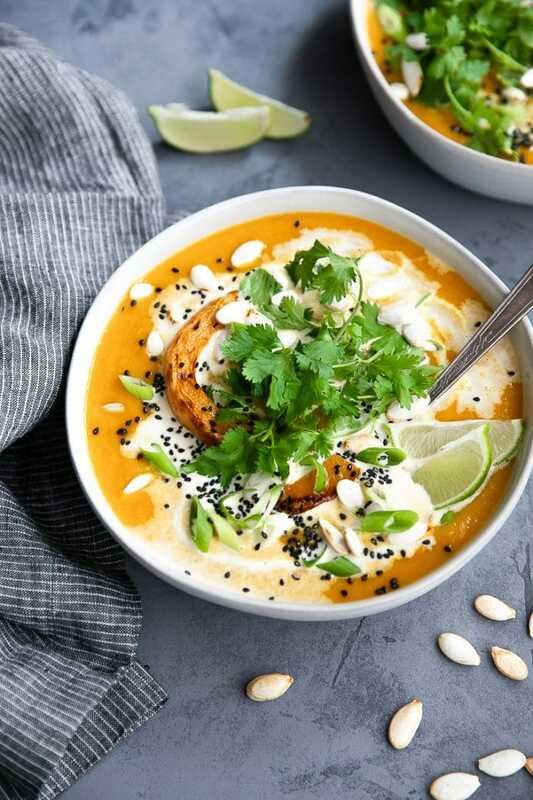 This Miso Coconut Butternut Squash Soup combines rich and complex flavors from roasted and caramelized butternut squash, creamy coconut milk, and salty miso to produce a smooth and creamy vegetable-filled soup. Like any butternut squash soup, this soup has simple, healthy ingredients and is perfect served as a main or as a side. My love for pumpkin and butternut squash soup runs deep. 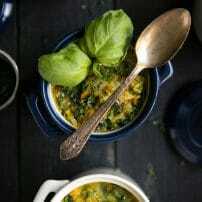 One would imagine that such a strong connection to a food would bring with it some kind of first memory, but honestly, I have eaten squash soup so many times that somewhere along the way this memory was lost. Either way, squash soups like this one with bacon or this Thai version are always one of the very first things I make the moment I see squash hitting the shelves in supermarkets and are on constant rotation until mid-summer. Squash is extremely versatile. In other words, it’s easy to have squash take on just about any flavor from sweet to salty to savory. Squash soup is no exception. Squash soup has the potential to be very healthy. Leave out the heavy cream and loads of cheese and you’ll have a real winner that is not only healthy but also delicious. Squash soup can be smooth and creamy or chunky and thick. See what I mean about the versatility? It mixes well with other vegetables. 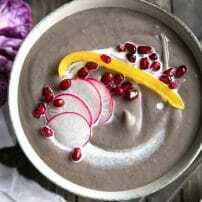 It’s a relatively low-calorie, low carbohydrate food. Like the cauliflower, squash is a great alternative to potato. It’s slightly sweet and thick when blended. It’s my no-guilt food. In short, miso is fermented soybeans. Light miso (or white miso): light miso is much sweeter and “mellow” tasting. White miso is perfect if you’ve never tried miso before and have no idea what it tastes like. Light miso has a higher amount of koji (remember the mold?) to soybeans and a shorter fermentation time. Dark miso (or red or brown miso): opposite of light miso, dark miso has a longer fermentation time and is saltier. Depending on personal taste preference or the dish being prepared, you may or may not want the more intense flavor. 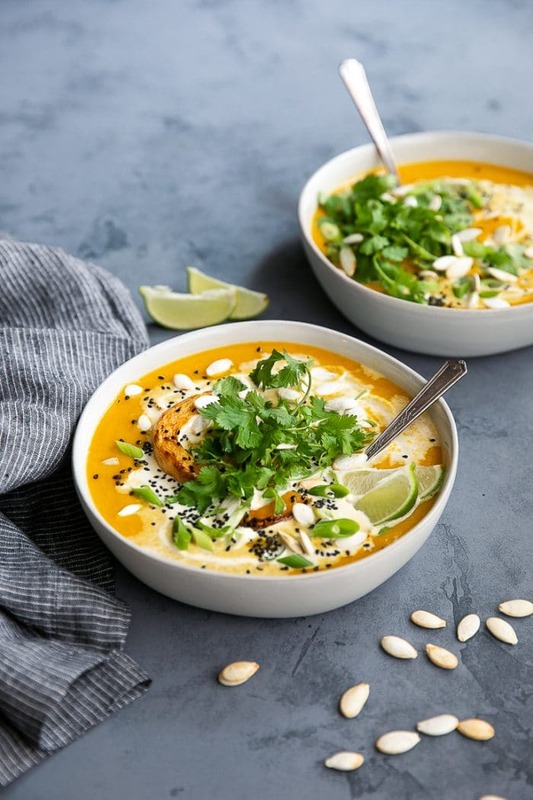 You could use either light or dark miso when making this miso coconut butternut squash soup, but if you’re new to miso I highly recommend starting with the light version. Roast the butternut squash (or pumpkin) before adding it to the soup. While you don’t have to roast the squash first, it’s recommended if you have the time. Roasting long enough for the squash to start caramelizing gives an extra layer of delicious flavor to the soup. On the flip side, if you have zero time, feel free to use canned pumpkin or butternut squash. Don’t worry, the soup will still taste great. Coconut milk is your friend, don’t be afraid to use it. Depending on how much you love the taste of coconut milk, you can choose between reduced-fat, full-fat, or coconut cream. 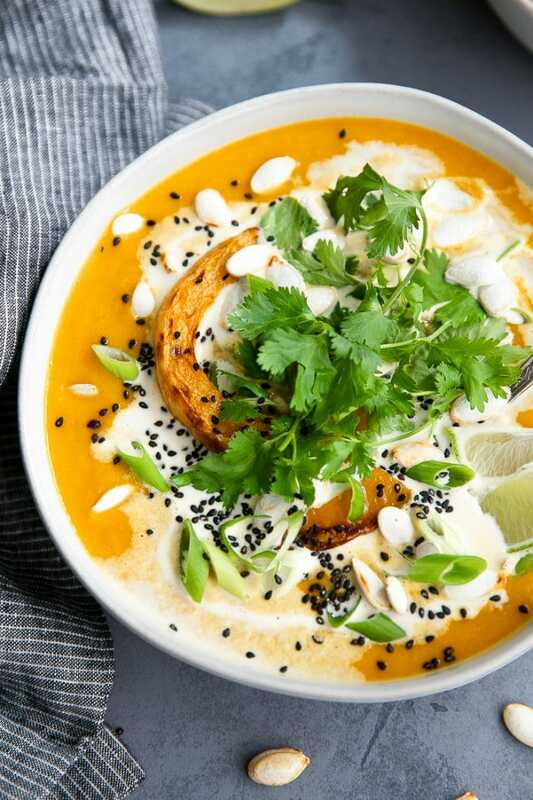 I highly recommend using one can of full-fat coconut milk for this miso COCONUT butternut squash soup, or, at the very least, drizzling the top with full-fat coconut milk. Low-fat coconut milk is essentially water. If you’re concerned about the fat and calorie content in full-fat coconut milk, use just half a can. Blend it well and blend in batches. Don’t over-fill your blender, my friends. Be patient and blend this soup in batches. Or use an immersion blender. I just purchased THIS ONE and boy, oh boy does it work! It’s better to start with this squash soup on the thicker side and add additional broth later as you can’t really go back and thicken it after you’ve blended everything together. Once the squash and vegetables have all been blended together and the coconut milk and miso has been added, do not try to boil this soup. It’s going to be too thick. Keep the stove on low, cover, and stir often. Don’t be afraid to garnish your bowl! Whenever I decide to keep a meal vegan, nuts, herbs, and seeds are always my favorite additions. An easy to make classic, this fall and winter comfort food is healthy, delicious, and the key to surviving the freezing winter months. 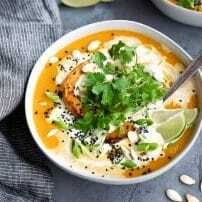 In this Miso Coconut Butternut Squash Soup, I've combined two of my favorite ingredients, butternut squash and miso, to make a fun and easy twist on classic Squash Soup. 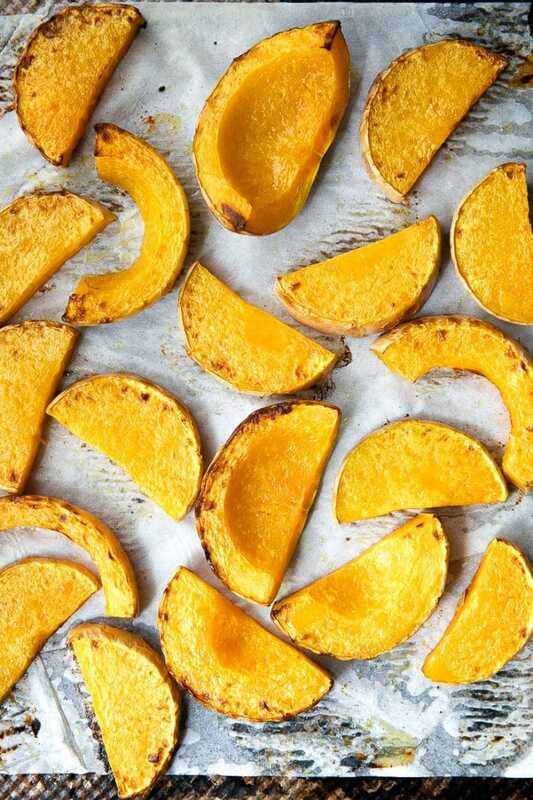 Wash the skin of the squash and cut into 0.5" inch slices and then into half moons. Brush the squash with olive oil and sprinkle with salt and pepper. Transfer baking sheet to the oven and bake for 30-40 minutes, flipping halfway through cooking. Remove from the oven and allow to cool before peeling the skin off the flesh. Set aside. Heat 2 tablespoons olive oil in a large stock pot or Dutch oven over medium-high heat. Add the onions and cook for 3-4 minutes, stirring often. Add the celery, carrots, and cauliflower, and sprinkle with salt and pepper. Stir well to combine. Cook for approximately 5-6 minutes, stirring frequently. Add the garlic, ginger, and chopped red chili to the pot. Cook for 2-3 minutes, stirring continuously. Add the vegetable stock and bring to a low boil. Cover with a tight-fitting lid and reduce heat to low. Simmer until vegetables are soft (approximately 10 minutes). Remove from heat and transfer the cooked squash to the pot. Use a hand blender or high-speed blender to puree the soup until smooth and creamy. Add the coconut milk and stir to combine. Transfer the miso paste to a small cup filled with warm water and whisk well to combine. Stir the miso into the soup and return the pot to medium-low heat. Heat just until warmed through but not boiling and season with salt and pepper, to taste. 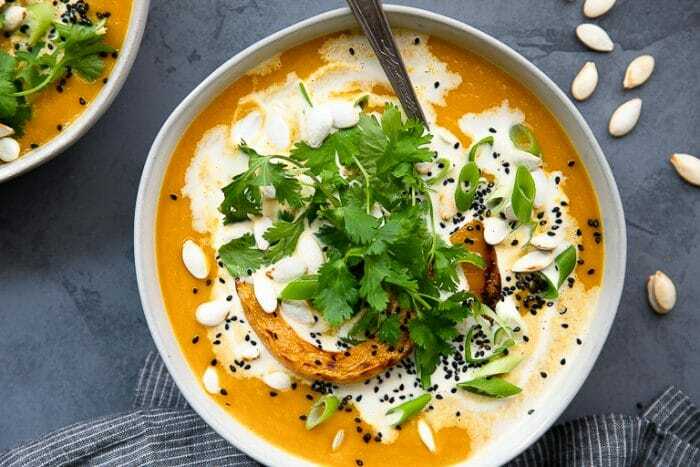 Garnish soup with fresh cilantro, roasted butternut squash slices, sesame seeds, pumpkin seeds, coconut milk, and green onion. Enjoy! This was absolutely delicious! Sweet (butternut) with a little bit of tang (chilli) and saltiness (miso). The ginger flavour comes through as well. If you hate certain vegetables, I suggest using this recipe as you can only taste the butternut. I detest celery but you can’t taste it at all. Easy to make and the directions were easy to follow. I reduced the amount of butternut and added in extra vegetables (eggplant, broccoli). 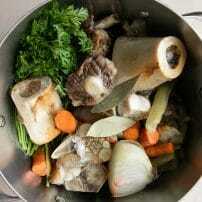 If you plan on storing it and heating it up, I suggest you thin the soup with extra vegetable stock. It accounts for evaporation so your soup doesn’t get too thick after being in the microwave.